Why a Catholic school? Why St. Mary Cathedral? A Catholic school is a place where faith and academics meet and grow. It is this strong foundation that creates a well-rounded student. By omitting the faith component, we omit Christ in our intellectual life. By implementing a strong faith-based education, we realize what a Catholic school does. A Catholic school provides each student with a Christian learning environment, a place to learn about the teachings of Christ and develop a personal relationship with Jesus. This promotes kindness, trust, and respect, true components of being a disciple. A Catholic school provides an amazing atmosphere to mold attitudes toward learning. Developing a positive attitude toward academic ethics is a key element to success. This happens when Christ is at the center of education. Christ should be present in everything, especially learning. A Catholic school provides positive teaching to ensure learning and development. Not only do students learn, but they teach others about what they learned. A Catholic school strives to enter into the heart of every student. Having heart will allow students to develop and mature as children of God and this, in turn, reflects outwardly as tough challenges arise. A Catholic school instills an outstanding obvious reflection of who students are and who they are yet to become. A Catholic school instills love; the very foundation of a Catholic school is love, mixed with academics all students flourish. Learning within the presence of love does not feel like learning at all. A Catholic school sets the goal standards high to promote intelligence. A Catholic school offers Christ- and Christ is enough. Those considering St. Mary’s for their children, please call the office at (989)732-5801. I want to share with you what attending St. Mary School these last 11 years has done for me. Many people probably wouldn’t expect a lot out of a deaf person – but not my teachers, they push me every day and encourage me to take on any challenge presented to me. 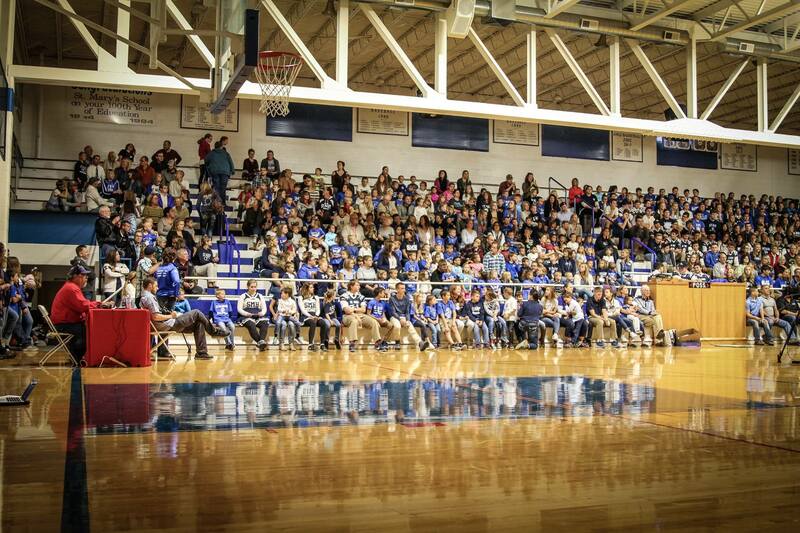 This entire school is my family and I feel loved and supported every day from the moment I walk through the doors. 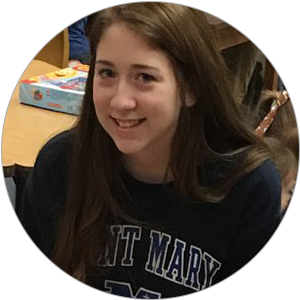 Attending St. Mary School has helped me to grow in my faith, given me strong moral values and continues to shape me into the person I am growing up to be. In FAITH at St. Mary School, we are exposed to an environment that I feel so blessed to be part of. God is at the center of all our activities – from morning prayer, weekly mass in the gym, religion class, praying before lunch, keeping prayer part of athletic events and practices, as well as activities outside of school, we take time out of every day to thank the one who has given us everything we have and everything we are. St. Mary helps each of us every day to grow in our relationship with God. In KNOWLEDGE, St. Mary School academically has its own unique environment. Small class sizes allow our learning experiences to be different. Our teachers are able to help us more individually. We are all different (I am different) and how each of us learns is different; our teachers work hard to make sure that we are all succeeding in our own unique way. They are the most caring teachers and truly want the best for us. The world we live in today is repulsive and sinful in so many ways. My generation is growing up in a world full of hatred and anger. Do we really want that to be the future? It is a big job to educate the next generation, to give them the ability to love and forgive others. A Catholic school teaches children so many things that help open their minds, shape their souls, and develop a foundation that will last them for the rest of their lives. A Catholic school is the biggest youth ministry that a parish can have – and we’ve had ours for over 120 years! THANK YOU for continuing to support St. Mary School and helping to mold the lives of so many young people. St. Mary Cathedral School. These words may mean different things to different people. It could mean school or work, boredom, fun, friends, and maybe even family. Everybody who has attended here or worked here has some sort of feeling connected with this place. To me, St. Mary’s is a place of learning, a place to see my friends and a place to follow in my siblings’ footsteps. St. Mary’s Cathedral School is a Catholic School that focuses on nurturing lifelong discipleship in the Lord, promoting academic excellence, and cultivating our God-given talents. I love this school because I can learn the usual school stuff and about my faith and God all in one day. St. Mary's also provided awesome athletic programs and a Drama Club which let me do fun activities that I’m good at to help my talents grow. A day in the life a student at St. Mary’s is so packed with education and learning, I’m glad I have my friends there with me. A perk of being a St. Mary’s student is I have the same kids in my class every year. This is awesome because I can have a group of really close friends and not have to worry about making a new group next year. I love seeing my friends at school every day because I can always count on them to cheer me up or make me laugh. My friends make it easier for me to get through the day, and I’m grateful that St. Mary’s is a place where my friends are always there for me. When my family moved here 15 years ago, my siblings had to start a new school. My parents chose St. Mary’s. When I asked my siblings how it was, they said that the staff and kids were all very kind and welcoming. Then when I started school here, I tried to be as kind as everybody else and follow in my siblings’ path. They all participated in many years of drama and choir, so I have too. 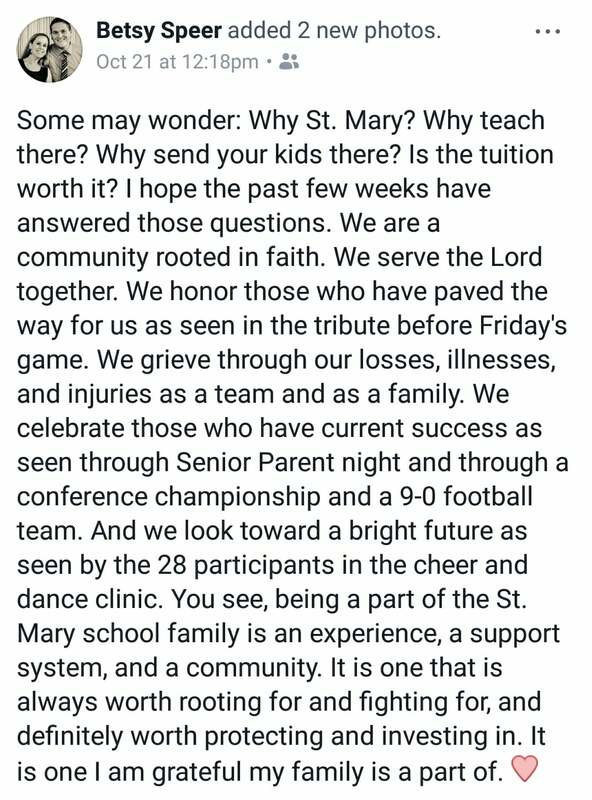 St. Mary’s lets me be closer to my siblings (they are all married now and moved away) in a way no other school could offer. St. Mary’s Cathedral School is a place of learning, a place to see my friends and a place to follow in my sibling's footsteps. St. Mary's taught me lessons that I would not get at any ordinary school. Some people have a home away from home, and mine is St. Mary’s.